Pickens, William Bruce. Bill Pickens of Tempe, Arizona passed away on November 12, 2010, at the age of 79 after an extended illness. 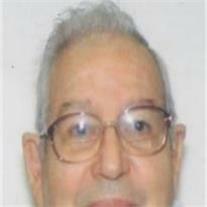 He is survived by his wife, Loretta; three sons, Gary (Colleen), Bruce (Chloe), and John (Suging); two step-sons, Riff Hall (Corrine), Ed Hall; sister Betty Jo Patterson (Roy); 14 wonderful grandchildren and 8 terrific great-grandchildren. Bill was a native of Mesa, Arizona and was proudly retired from the United State Air Force as a Lt Colonel. Visitation will be Friday, November 19 from 1-3 PM at Bunker’s Garden Chapel, 33 N. Centennial Way in Mesa followed by interment in the City of Mesa Cemetery. A memorial service will be held Saturday, November 20, 2010 at 10 AM at Friendship Village Skirm Auditorium, 2625 E. Southern Ave. in Tempe. In lieu of flowers, donations may be sent to The American Heart Association.